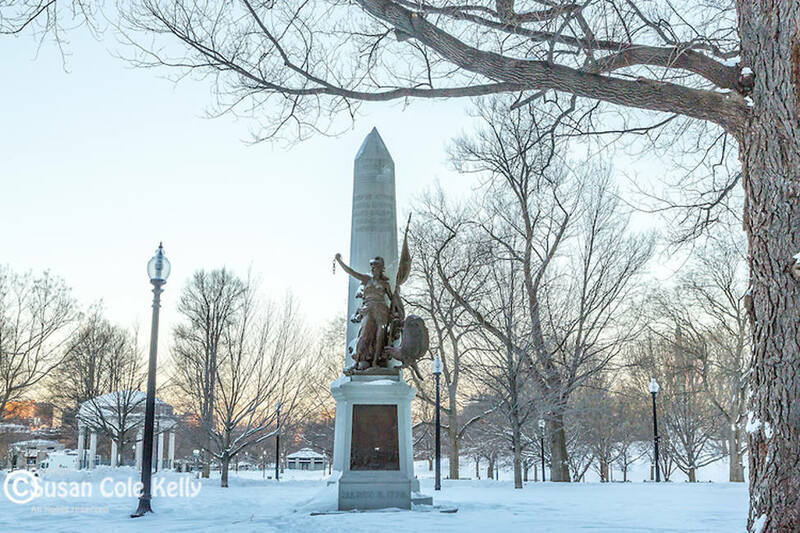 Location: Boston Common. Between Tremont St and Avery St in Boston, Massachusetts. Map it. The Boston Massacre / Crispus Attucks monument honors the victims of the Boston Massacre. It stands at 25 feet high and 10 feet wide. On top stands a figure representing the Spirit of the Revolution inspired by Eugene Delacroix’s painting of Liberty Leading the People, a symbol of the French Revolution. She holds a broken chain in her right hand to symbolize freedom from the oppressors and in her left hand she holds the American flag. With her right foot she crushes the crown of the British monarchy and next to her other foot an eagle prepares to fly. 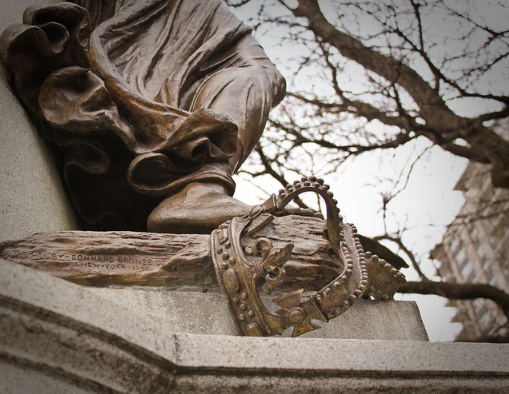 The Spirit of the Revolution crushing the British crown. At the top of the column and behind the Spirit of the Revolution in raised letters are the names of the five martyrs: Crispus Attucks, James Caldwell, Patrick Carr, Samuel Gray and Samuel Maverick. 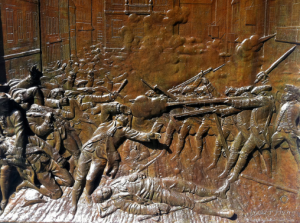 The base of the monument portrays a relief of Boston Massacre and below it is the date March 5, 1770. Relief of the Boston Massacre shows Crispus Attucks laying dead. In 1887 the Massachusetts General Court decided to erect a memorial to those who died on the night of the Boston Massacre. Many city officials were opposed to the project arguing about its appropriateness, historical distortion and political opportunism. Some members of the Massachusetts Historical Society were strongly opposed to its erection remembering the event as John Adams described it in court. 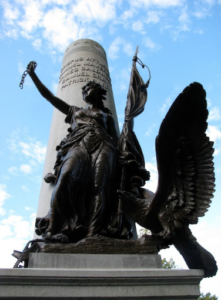 Despite of their objections the monument was supported by prominent citizens including black and white abolitionists and was erected in 1888. It was fully paid for by public funds.